This Incident Report describes how the Border Guard Force (BGF) armed group led by Non-commissioned Officer (NCO) Maung Na forced Saw Z--- from Y--- village, T’Kwee Kla village tract, in Hlaingbwe Township to serve as a navigator (guide) in the period between October and November 2017. This was dangerous for Saw Z--- due to the presence of landmines in the area and the risk of the Democratic Karen Buddhist Army (DKBA) splinter group attacking. Since Saw Z---did not have time to secure his family’s livelihood, his family faced food shortages and health challenges while he was away. The following Incident Report was written by a community member in Hpa-an District who has been trained by KHRG to monitor local human rights conditions. It is presented below translated exactly as originally written, save for minor edits for clarity and security. This report was received on 13 February 2018 from Hpa-an District. I [KHRG researcher] met with the victim, Saw Z---, and interviewed him on November 22nd 2017 in Y--- village, T’Kwee Kla village tract, Lu Pleh Township, Hpa-an District. He talked about his experiences journeying to the front line as a navigator for the Border Guard Force (BGF). The victim provided the information himself, therefore it is accurate. 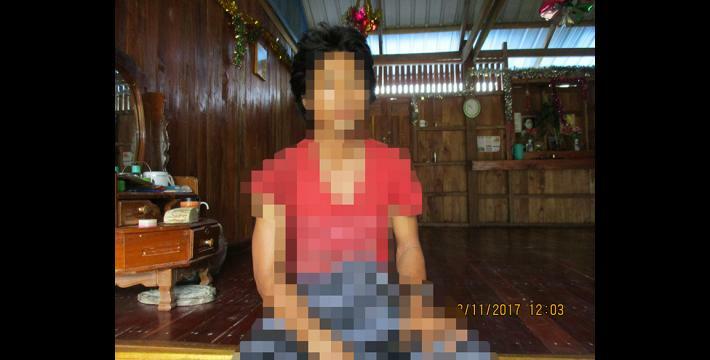 Saw Z--- is [censored for security] years old and lives in Y--- village, T’Kwee Kla village tract, Lu Pleh [Hlaingbwe] Township, Hpa-an District. Since the first week of October until November 2017, he has been forced to be a navigator for the Border Guard Force [BGF] on the front line. Saw Z--- is a native villager in the fighting area, so the BGF forced him to be their navigator so the BGF could attack the DKBA splinter group in T--- area. The distance between Y--- [village] and T--- area is one day by foot. Saw Z---had to walk ahead of the BGF, which was dangerous due to the presence of landmines in the area and the risk of the DKBA splinter group attacking. Since he was forced to be a guide for the BGF for almost two months [from October and November 2017], he did not have time to secure his family’s livelihood, so his family faced food shortages and fell into debt while he was away. His family now faces major challenges in their daily life. For example, the armed group [BGF] ordered Saw Z--- to meet with them, and he could not make it to them on time by travelling on foot. He became concerned they might become angry with him, so he borrowed money from his neighbor for a motorcycle taxi to reach the armed groups in time. Similar situations occur where villagers have to borrow money when the armed groups order food, such as pig [pork], chicken and more in order to bring what the armed groups orders on time. Saw Z--- also heard a rumour that commander Bo Bee of the DKBA splinter group ordered his soldiers to shoot the [BGF] navigator first, so Saw Z--- felt threatened and felt that his life was at risk. Thus, he asked the BGF to give him a gun in order to protect himself on the front line. Saw Z--- spent only two days with his family after he returned from the front line as a guide for BGF, but he was ordered by this armed group to guide them again [on November 23rd 2018]. The victim gives permission to KHRG to use the information in this publication. BGF Battalions under Major Soe Naing’s have been implicated in previous abuses against villagers according to KHRG reports. See “Hpa-an Incident Report: Violent abuse and killing committed by BGF soldiers in Myaing Gyi Ngu Town, Hlaingbwe Township, April 2015,” August 2015. This information has been reported by KHRG previously in, “Ongoing fighting, displacement, landmines, porter demands, and child recruitment in Hlaingbwe Township, Hpa-an District, October and November 2017,” December 2017. The Democratic Karen Buddhist Army (DKBA) was re-formed on January 16th 2016 as a splinter group from the Democratic Karen Benevolent Army (2010 – present), and is also referred to as Na Ma Kya (‘Deaf Ear’). During fighting between the Tatmadaw and DKBA Benevolent throughout 2015, there was internal disagreement within the DKBA Benevolent which resulted in a number of commanders being dismissed in July 2015. These former commanders then issued a statement in January 2016 declaring the formation of a new splinter group. This organisation has phrased the formation of this group as the revival of the original Democratic Karen Buddhist Army which was formed in 1994 until it was broken up in 2010 into the BGF and the still-active DKBA Benevolent. The group is led by General Saw Kyaw Thet, Chief of Staff and General Saw Taing Shwe aka Bo Bi, Vice Chief of Staff. Other lower ranking commanders in the DKBA Buddhist splinter group are San Aung and late Kyaw Moh aka Na Ma Kya (reportedly killed on August 26th 2016). The group is currently based in Myaing Gyi Ngu area in Hlaing Bwe Township, Karen State. This DKBA Buddhist (2016 – present) should not be confused with the DKBA Benevolent (2010 – present) from which it broke away in January 2016, or with the original DKBA (1994 – 2010) which was broken up in 2010 into the BGF and the DKBA Benevolent. Importantly, the DKBA Buddhist has not signed the preliminary or nationwide ceasefire with the Myanmar government whereas the DKBA Benevolent has signed both agreements. According to the 1949 Geneva Convention III and 1997 Additional Protocol I, as well as other sources of customary international law (IHL) civilians are defined as “persons who are not members of the armed forces” and those who do not carry arms openly. Therefore, this villager’s status as a civilian is complicated by the fact that he was forced to act as a navigator for the BGF, as well as by the fact that he chose to openly carry a weapon while accompanying the two armed groups to the front line. IHL is ambiguous as to whether members of armed groups, such as navigators, are considered civilians or not, however, it is possible that this villager lost his status as a civilian by openly carrying a weapon, and was thus no longer protected as a civilian under IHL from attack by armed forces while he was on the front line.